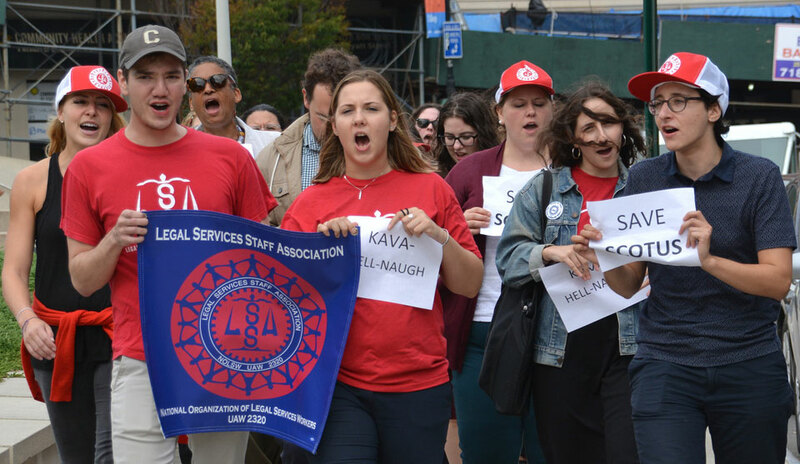 STATEN ISLAND, N.Y.—Holding signs that read “Kava-Hell-Naugh” and “Save SCOTUS” while chanting “Kavanaugh, Kava-no, the abuser’s got to go,” two dozen members of the Legal Services Staff Association (LSSA), UAW Local 2320, stood on the steps of the Staten Island Criminal Court building Thursday afternoon protesting Trump’s embattled Supreme Court nominee. 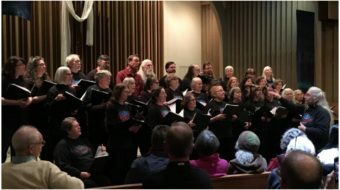 With the historic St. George Theatre stage left and the criminal courthouse stage right, a lively group of LSSA activists took part in a coordinated, five borough-wide, protest. In other boroughs, LSSA members were joined by colleagues from the Association of Legal Aid Attorneys, UAW Local 2325. LSSA and ALAA members represent low-income New Yorkers in civil and criminal cases, protecting what they regard as their clients’ basic rights. “As a Federal Judge, Kavanaugh has demonstrated his disdain for the environment, the rights of women, the rights of people of color, and other oppressed people,” said LSSA President Sonja Shield. “Even before Dr. Ford came forward, it was clear that Kavanaugh was an ideologue perfectly tailored to carry out President Donald Trump’s agenda. The Senate hearing last week dramatically demonstrated the damage these beliefs will cause. Local attorney Nora Renzulli was leaving court as the march took place. “I am glad to see members of our legal community taking a stand. They are in good company because more than 500 law professors have condemned Kavanaugh for ‘lack of judicial temperament,'” she said. 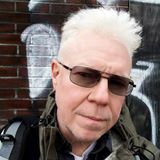 Thomas Altfather Good is a freelance photojournalist, editor and Database Administrator living in Staten Island, New York. 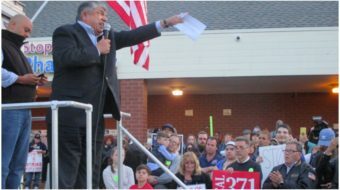 Good covers labor and civil rights and is a member of the National Writers Union, UAW Local 1981.